Show your brand in marketing videos with embroidered logo wear. - Embroidery For You! 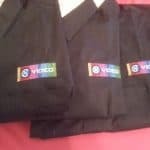 Show your brand in marketing videos with embroidered logo wear. With the explosion of videos and “going LIVE” on social media platforms, be sure to advertise your brand. Of course, quality content is needed in the video but you want to be sure your company name/ logo / brand is also noticeable. While social media marketing is the current trend, when you are LIVE or doing a video, your potential client can see you and see your logo. Your clients will retain your logo by shape / color with repetition. Post that video to your Facebook business page, to your website, and to your LinkedIn page. Embroidery For You! can assist with your custom logo design and your embroidery needs. We can also provide the apparel as well as the embroidery services to make us your one stop for your branding and promotional needs. A left chest logo is “prime real estate” to advertise your business.